L-Tron wishes a Happy Birthday to our team members born in September. Happy Birthday to Tom, Gayle, Charlie and Marisa! The L-Tron staff celebrated September birthdays this month. These birthday celebrations all included cake, balloons, cards and sweet treats for the team. We made sure to have vegan treats for our newest team member, Radi. 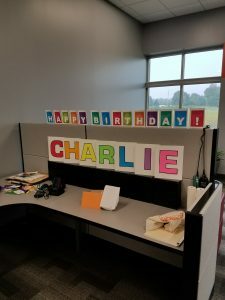 The operations department took time to make personalized birthday signs for each employee, making them feel extra special (and appreciated) on their day. Of our September birthdays, we have two Libras and two Virgos. Roughly 18% of all our employees have birthdays this month! Tom is the L-Tron Operations Team Manager. Tom joined the L-Tron family 2017 and helps to keep the office running smoothly. He reaches out to our vendors, maintains stock levels, and assists us with maintaining 100% quality standards. Tom was born, raised and has lived in Rochester his entire life. He has been married for 15 years and credits his wife with keeping him grounded. Tom loves live music and going to concerts – he has seen Heart (the band) over 200 times across 36 states. 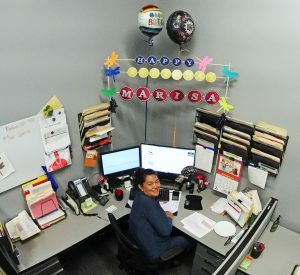 Marisa joined L-Tron almost exactly one year ago and is a tremendous asset to our Operations Team. Marisa brings a strong background in quality, procedures, customer service and order fulfillment. She enjoys live music, Thai food and camping. Marisa’s perfect day would involve cruising around on her motorcycle or spending a day with all three of her children. Marisa loves dragonflies and they were even featured on her celebration sign. Gayle is the Chief Marketing Officer and the Chief Operations Officer at L-Tron. She is a partner in the company, and guiding light to both the Marketing and Operations teams. Gayle is a strong advocate for female leaders and women in technology fields, this year she was a finalist for several awards including Digital Rochester Technology Woman of the year, and the Victor Chamber Women of Excellence Award. She gives back to the community and is passionate about everything she does. When Gayle is not spending late nights at the office or thinking about work in the shower, she enjoys Tai Chi and spending time with her 7 grandchildren. 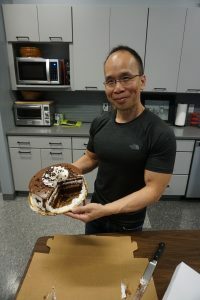 Charlie is an L-Tron engineer and is celebrating 21 years with the L-Tron team. He deals with all of our customer support requests, assists with training, and much more. Charlie also attends several conferences each year with the Marketing Team. This past year, he attended ESLETS, and many customers met with him to see demos of our 4910LR Driver’s License Reader and our OSCR360 Solution. Charlie enjoys spending time with his wife Martha, their children and their two puppies. For his birthday weekend, he spend time on Canandaigua lake and enjoyed wine touring with friends. Check out some pictures from our celebrations! Watch Tom explain his own ‘Ding-Dong’ Birthday cake. 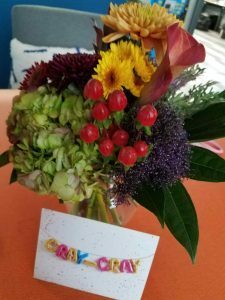 You can also click here to read about how we celebrated September birthdays last year. Questions? Interested in learning more about L-Tron Company Culture?